If you’re new to river cruising; you might be feeling unsure about making your first booking. 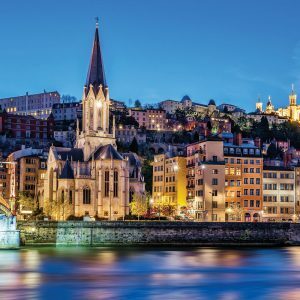 Hopefully you’ll find this guide of what to expect on-board one of our cruises a reassuring read – and helpful in preparing for what might be your first, but is unlikely to be your last, river cruise with Riviera Travel. At Riviera Travel we’re passionate about quality, which means that our guests are able to relax with the expectation that every aspect of their river cruise has been carefully considered to uphold the highest standards. There’s a definite focus on destinations on our river cruises, and we love helping our guests experience the very heart of a place, through expertly guided tours and itineraries that include everything of importance along the way. The atmosphere on-board our small ships is relaxed and friendly, and as many customers book with us time and time again, it’s not unusual to come across the same faces – hopefully the faces of newfound friends! s on Riviera Travel ships. Instead we focus on maximising light and using the finest materials – polished marble, sparkling glass, sumptuous soft furnishings and warm wood – to create a classy but cosy boutique hotel feel. And with five brand new ships for 2017, our fleet is looking better than ever. Our cabins all have that luxury hotel feel, while also boasting all the comforts of home – including tea and coffee facilities from well-loved brands. 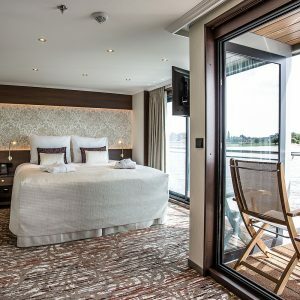 Whether you want to enjoy a coffee from the Nespresso machine as you look out over the river, or you’d like to kick back on your full-sized bed to watch the flat screen TV, our cabins have been designed to make the time you spend in them as pleasurable and comfortable as possible. 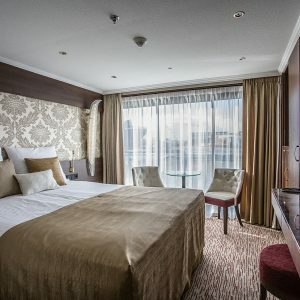 We even offer individually controlled air-conditioning or heating, so you can set the temperature to your exact preference, and complimentary Wi-Fi as standard. We’re also proud of the generous dimensions of our cabins – we prefer not to cram guests onto our ships like sardines! For example, suites on our new all-suite ships start at 17 square metres, placing them amongst the largest on any European river cruiser. Add gleaming marble bathrooms with fluffy towels and luxury toiletries, crisp cotton bed linen with your choice of pillows, and beautifully designed décor, and you’ve got cabins that you’ll almost hate to leave! You can expect five-star dining, but without any stuffiness. Our guests choose where they sit and with whom – we don’t enforce seating policies, although the helpful Maître D’ will assist you with seating if you wish. Early risers on- board can start their day with tea or coffee and freshly baked pastries on the Sun Deck, with a full breakfast buffet, including more than 60 hot and cold options, served a little later. 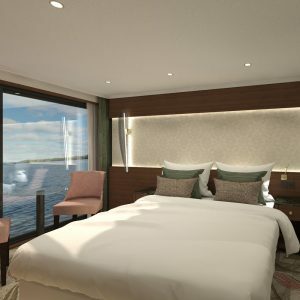 Or you can choose to take a continental breakfast in the comfort of your cabin at no extra cost. The lunch buffet, afternoon tea and chef’s special patisserie ensure you’re kept fully sustained until the culinary highlight of the day – the delicious four course dinner served in our elegant dining room. Drinks are not included on a Riviera Travel cruise as we’ve found that many of our guests prefer to simply pay as they go. 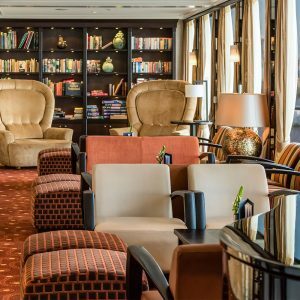 Entertainment is kept low-key on our cruises, as many guests are happy with good conversation in the comfortable lounge and bar areas, or like to retire early to rest for the sightseeing adventures ahead. However, the welcome reception and dinner at the start of every cruise, and the six course Captain’s gala dinner towards the end, are always thoroughly enjoyed. We also have a musician providing subtle entertainment, and will often invite local musicians on-board to entertain you with performances traditional to the place we’re sailing through. Although our focus is on spending as much time as possible exploring the beautiful places we sail to, we also ensure that our ships have all the facilities you need to enjoy your time on-board. 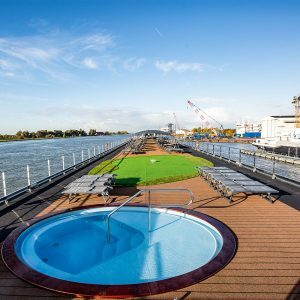 Our Sun Decks are the perfect place to watch the scenery pass by from a comfy chair or lounger, and some ships boast splash pools and putting greens too. 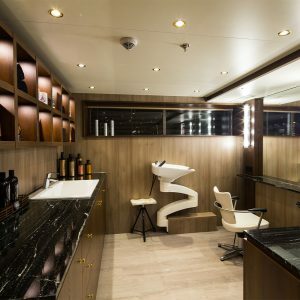 On-board hairdressing salons and wellness areas offer the opportunity to relax and be pampered, and a giant chess set will pass the time with some friendly competition. All ships also have air conditioning, Wi-Fi and a small library, and a tea and coffee station for you to help yourself whenever you fancy. We don’t enforce a formal dress code on our cruises, as we want our guests to wear what they feel comfortable in. During meal times we suggest smart casual attire, with no dinner jackets or ties required – however some guests do like to dress up formally for the welcome and gala dinners. With a crew to guest ratio of 1:4, we’re confident in our ability to provide exceptional levels of service on all our river cruises. Especially as all our staff are trained in-house to ensure they meet those exacting five-star service standards. All ships have a reception area that’s manned 24/7, so whatever time of day or night, there’s always someone available to meet whatever need you might have. You’ll also be escorted on your river cruise by a helpful tour manager. Although we pride ourselves on excellent service as standard, we also firmly believe that tipping should be at the discretion of the guest – therefore we don’t include tips in the price of our cruises, nor do we add a daily gratuity to your bill. If you do wish to tip, an envelope will be left in your cabin on the final evening for your convenience. 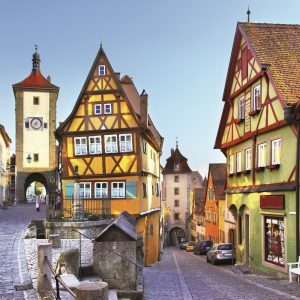 At Riviera Travel we take an all-inclusive approach to tours and trips, ensuring that everything that makes up the essence of your destination is included in the up-front cost of your river cruise. That usually means tours expertly led by a local guide, admission to the main sights, landmarks and attractions, and transfers to any out of the way attractions that we wouldn’t want you to miss. We also carefully plan our itineraries so that there’s plenty of time built in for you to explore under your own steam. And, of course, there’s absolutely no pressure to join any of the planned tours or trips on the itinerary. It’s your holiday, so you choose exactly how you wish to spend your time! Fair and honest pricing is one of our key values at Riviera Travel, and we operate a no surcharge guarantee as part of our price promise. This means you can rest assured that the price you see is the price you pay. We also refuse to artificially inflate our prices, just so that we can offer impressive discounts at other times. Quite simply, you won’t find our cruises fluctuating in price, so you can book with confidence. Another of our key values is quality. We don’t focus on ‘cheap’. Instead we bring you the very best quality luxury river cruises at fantastic ‘no hidden extras’ prices. I like the idea of going on a river cruise, but I have limited mobility. I don’t want to find myself restricted to staying on board instead of going on tours/excursions. Are the facilities compatible with mobility aids? I would advise you to speak with our Reservations Team to discuss mobility and the options that may be available to you on a river cruise. You can contact them on 01283 744 300 Mon – Fri 9am-7pm or Sat & Sun 10am-4pm. Thank you for your interest in our Enchanting Rhine and Yuletide Markets River Cruise. I would advise contacting our Reservations Department on 01283 742 300 to discuss the details of mooring and your daughter’s mobility requirements in detail. Gratuities on our river cruises are left at your discretion and we do not include them in the price of the holiday, so you can leave as much or as little as you like. As a guideline we advise €5 per person, per day on average but it really is up to you. Please see our Life on Board river cruise page for more information and FAQs. We have just returned from our second cruise with Riviera, this time on the Lord Byron on the Rhone. The cabins (and beds) were comfortable and had adjustable air conditioning to suit our requirements. The food in the restaurant was second to none for both breakfast and dinner and the lunch and afternoon tea were also excellent. The crew and the Riviera managers were very efficient and friendly and the crew put on an excellent show for us on one night. The trips were well organised and were led by very knowledgable guides who made them very interesting. All in all it was yet again an excellent holiday and we shall certainly be booking another one. WELL DONE! I am due to travel on the Thomas Hardy 18th June, I have been allocated cabin 237, at the very back end of the ship. Am I liable to have engine noise? You may hear some slight engine noise in cabin 237 but it should not be a disturbance as there is still space between your cabin and the engine room, and we do our best to keep the noise to a minimum. We hope you have a great time with us on this holiday! Any spaces for single travellers? Single supplement puts your river cruises beyond my resources. We have cabins for sole occupancy reserved on all three decks of each ship, on every cruise. Cabins on the lower deck do not carry a single supplement at all. Please contact our reservations department on 01283 744300 to see which itineraries and dates we may have available. I will be travelling alone and int to enjoy some luxury. What do your single cabins offer? I would like a large window or balcony and no engine noise. Do the single cabins offer these? How much is the single supplement? Single cabins are actually twin cabins for sole occupancy so are exactly the same size as the others with all the same facilities. For a large window you will need to look for a cabin on the middle or upper deck – all have french balconies and sliding patio style doors/windows. There’s plenty of room to sit by the window and watch the world go by with out the ‘need’ for a full blalcony. Some ships feature full balconies in the deluxe balcony suites. The single supplement varies from ship to ship – I would reccommend checking our website wwww.rivieratravel.co.uk or calling our friendly reservations team on 01283 742 300 who can talk you through availability and pricing. 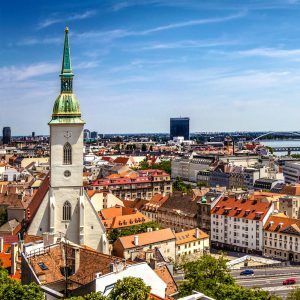 Ian Crosskell - please e-mail details of Budapest to Black Sea trip for 2018/2019. Just enjoyed a Riviera trip along the river Douro in Portugal. Beautiful scenery, interesting side trips, all well organised by tour director Mario. Ships crew efficient and very friendly under hotel manager Victor and cruise all as advertised. Will be very happy to sail with Riviera again. I have just returned from a river cruise on the Thomas Hardy I have to say this is one of my best holidays ever. Ships crew and hotel manager Helena are all excellent. Lesley and Annette the tour directors did everything possible to make the trips interesting they are very knowledgeable on the tours ashore. Thank you Riviera we will be cruising with you again.